Meetup | Fight Slavery Now! Indeed, it is the only thing that ever has“. This is where we started. It is called Meetup.com and our exact address is Meetup.com/Fight-Slavery-Now. We began as ‘New Yorkers Fight Human Trafficking’ but after attracting members from the tri-state area, we chose a less geocentric name for our group, hence Fight Slavery Now! Our official website is here at FightSlaveryNow.Org. 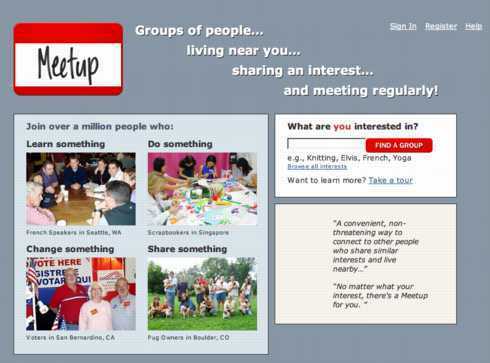 The Meetup sites have fostered a mini-revolution in social interactions. They uniquely bring together people with shared interests, not only in cyberspace, but also face to face, to meet one another in real life and actually DO things together. While best noted for connecting people along the lines of recreational interests, Meetup has been useful as a tool for social justice groups as well. One feature that makes it especially suitable for this is the Message Board. Here we can offer news and announcements, discuss ideas, argue about strategy, and plan for events. The beauty of this is that unlike e-mails, this is a community bulletin board, there for all to view at their convenience and to contribute to if they wish. Your personal email address as well as all other personal information, is never shared or displayed except what you choose to make public. Yet you may email others privately and they may contact you, with Meetup acting as the intermediary. Even the organizer and assistants are not privy to your personal information. The message board lends itself to being organized by subject, provides easy links between discussions, contains a search feature, and creates a permanent record. As replies are posted, those discussions come to the top of the queue so it is easy to stay current. You can track the entire board and receive an email notiﬁcation whenever there is a new post, or you may choose to track just certain discussions. A discussion pinned to the top of the board is titled “INFO and LINKS”. There you will ﬁnd links to all the major discussion threads as well as instructions on how to use all the features of the message board itself. Please also take look at our Files section. There we have accumulated a rich store of documents and information about human trafﬁcking, the modern abolitionist movement, and information from many other organizations about all aspects of this issue. We strongly encourage all members to contribute their thoughts, questions, suggestions, or criticisms. It is always easy to go back and edit or delete anything you have written, so there is no need to be shy. This is the dynamic part of our web presence where we can actually communicate collectively and share news and new ideas with one another and with you! Join us, and join in.